A rather bizarre PR stunt perhaps to mark the launch of the latest skateboarding video game, Tony Hawk: SHRED? 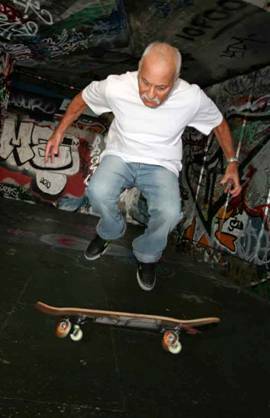 Meet Britain’s oldest skateboarder, Alfred Simmons, a 70 year old skater pictured here in a London skatepark. Alfred was tracked down as the oldest man on 4 small wheels which he has been doing for over 30 years and is still going strong. “Now I’m retired I can do the things I enjoy. Some of my friends and family think I’m a little crazy doing what they think is an extreme sport, but I’d rather be pulling off an ollie than sitting at home watching tv” said Alfred. An interesting ploy I am sure you will agree, and it obviously worked, hence us running it!! And for the gamers amongst you, Tony Hawk: Shred is released on Friday 29th October on Xbox 360, PS3 and Wii, grab it at Amazon.